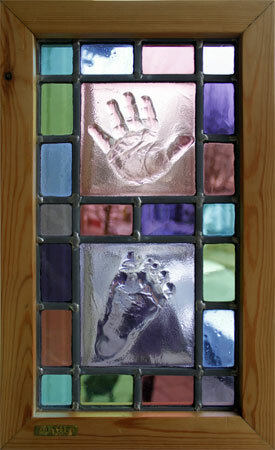 Glass imprints of a child's hand or foot mounted within a solid wood frame to form a unique stained glass hanging. The child's hand or foot is pressed into soft clay to capture the imprint. This clay is fired to create a permanent mould. A coloured glass plate is placed on the mould and heated in the kiln to fuse the image onto the glass. The glass panel is then surrounded with leaded stained glass and framed in solid wood. Choose from a wide range of glass colours: blue, pink, green, turquoise, purple or yellow. Prices include a coloured, leaded glass border with wooden frame and glass engraved with the child's name and age.